Phew, I'm glad you said that. From the graphs you posted I would have thought we were fecked otherwise. By the time we 'get out' of this mess we will be running right into the peak oil nastiness, take a moment to look back and admire the pinnacle of civilisation that we created. Nothing like a bit of good news on the fundamentals to trigger a buying frenzy. After all stocks do well when the economy is tanking....doesn't it? Bloody hell - scary graphs! For one moment there i was quite worried. But then I read the words on your post and realised everything is under control. Phew.
) -- A gauge of future economic activity dropped in June, the second decline in past 3 months, suggesting the economic recovery will weaken. If this keeps up it could be DOW 11,000 before we know it! Eurozone doing well too on the back of the stress test results that don't get officially released until tomorrow. It must ALL be contained. the Best of the Best of the Stressless Stress Tests mess. If they can't find a job they should move to Oakland, CA and join in on the soon to start crime wave. Chief Anthony Batts listed exactly 44 situations that his officers will no longer respond to and they include grand theft, burglary, car wrecks, identity theft and vandalism. More crimes you can now get away with at the link. Surely you jest, the next stop must be 12,000 as we blow past 11,000 in the blink of an eye? Seriously though, that graph looks very scary indeed. Look at how unemployment lags the previous recessions. Yikes! Is our real unemployment rate well over 10% (adding in the LT unemployment no longer on the books)? I know the last jump in our employment was down to P/T work which suggests we are heading in much the same direction as the US which means our house prices are destined for the same end. 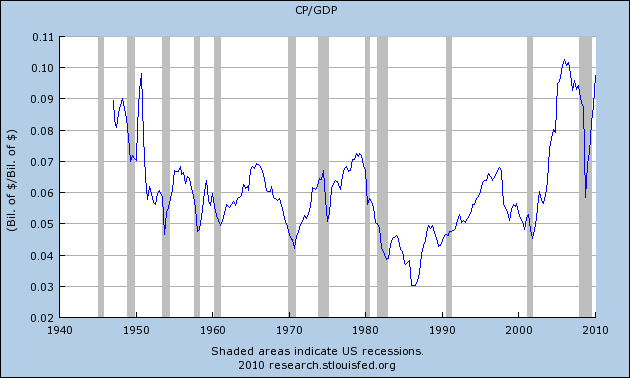 Hasn't hurt corporate profits which as a percent of GDP are right back to all time highs. It's only a line on a graph, you can't draw conclusions from a graph. After all it's only a line going nearly going vertically upwards.